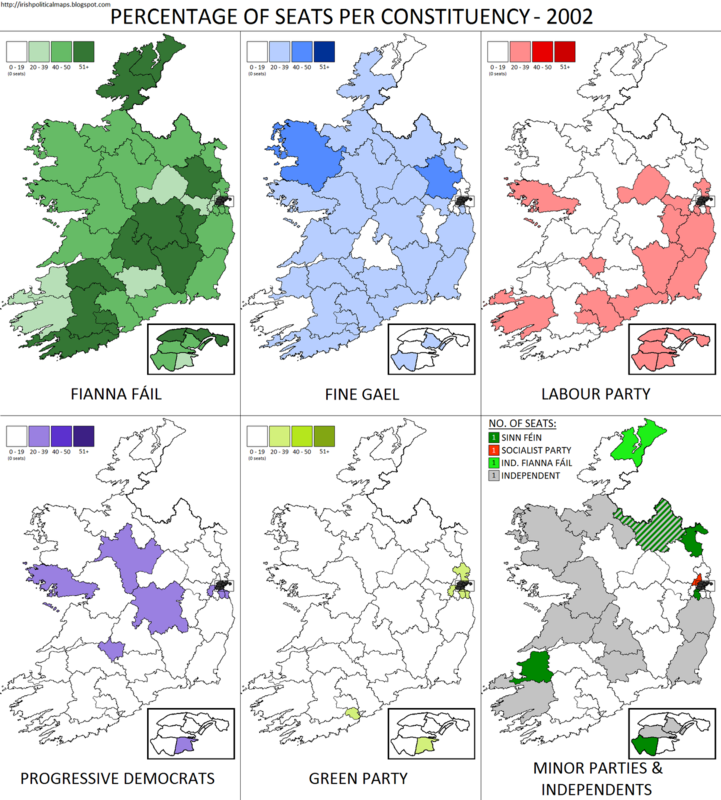 2002 saw the re-election of the Fianna Fáil/Progressive Democrats coalition government which had replaced the Rainbow Coalition of 1994-97. The latter's parties, Fine Gael and Labour (having merged with the Democratic Left) fought to win government back, but both failed heavily. A booming economy and the personal popularity of Taoiseach Bertie Ahern made Fianna Fáil a very difficult challenge for the Opposition parties. 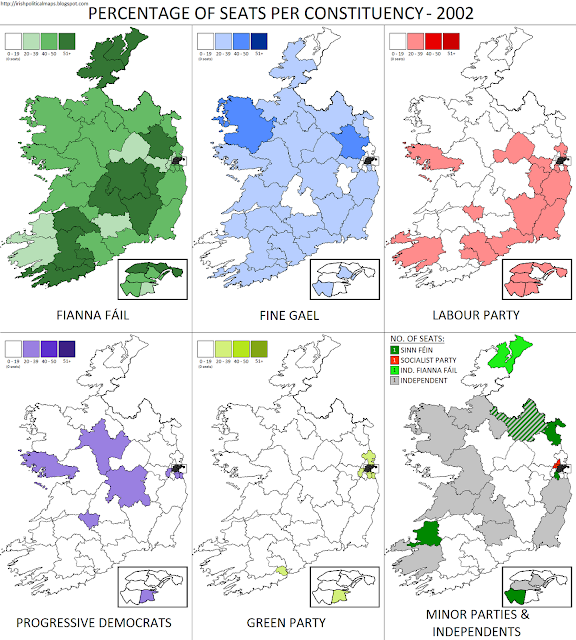 In this election, Fianna Fáil won 81 seats, matching their 1987 total - the last time the party was able to form a government on its own, as a minority administration. Rather than become a minority government again, the party bolstered its numbers by remaining in coalition with the PDs, who had won 8 seats in their best result in ten years. The big losers in this election were Fine Gael and Labour. The Labour party experienced a drop of 2.1% in their vote share, which resulted in the loss of a seat. 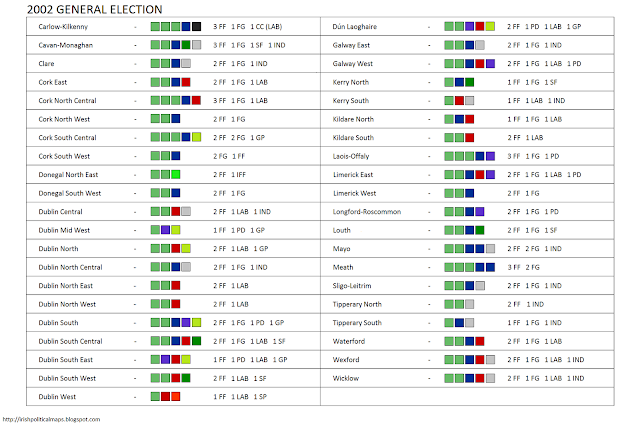 Fine Gael meanwhile dropped 5.4%, which resulted in a devastating blow for the party with 23 seats lost. Both party leaders resigned and were replaced by new figures - Labour by Pat Rabbitte and Fine Gael by Enda Kenny, a long serving Mayo TD who now had the large task of rebuiliding a demoralised and diminished party. Not all Opposition parties faced doom and gloom however: the Green Party and Sinn Féin both made impressive gains, bringing their seat totals to 6 and 4 respectively. Socialist Party leader Joe Higgins held the seat he won in 1997. Independents also fared well, with 13 counties electing Independent TDs - including Niall Blaney, the latest of the Blaney family to win election as an Independent Fianna Fáil TD for Donegal North East. Blaney would join Fianna Fáil in 2006, ending the decades long split from the party begun by his uncle in 1970.